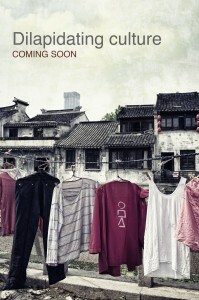 Images of Liverpool and China will be exposed to the elemental challenges as the cultures they portray. While nothing man made can last forever, without conservation, immaterial culture as well as material objects will carry the scars of life and the signs of ageing. As the modern world builds around what is left of our heritage the demand is greater than ever to conserve. Yet there is a sense of unease, in one case a restoration project can be met with joy, and another can merely resemble a theme park. Some pieces of the past make the cut to be restored for modern purposes, some continue to decay, ironically those that decay carry more relevance and are not converted into funky shells for coffee chains and backdrops for holiday snaps. Instead the areas that get left behind engender a new lease of life, as canvases for urban art, underground hangouts and in some cases continue resist modern life. it is a life that will never last yet embodies the sense of culture the world is struggling to maintain. Aptly hosted by the bombed out church, images of Liverpool and China will be exposed to the same elemental challenges as the cultures they portray. Who knows how they will last. While nothing man made can last forever, without conservation, immaterial culture as well as material objects will carry the scars of life and the signs of ageing. How we deal with that is up to us all.